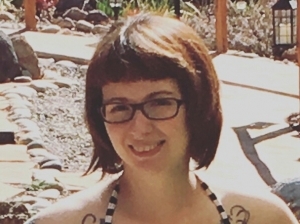 Anna Christine Curran, 29, of Albuquerque, NM, formerly of Wilmington, DE passed away on September 27th at her home. She was born in Upland, Pa. to Joseph and Jane Clawson Curran. She was raised and educated in Claymont and Wilmington, DE where she attended Holy Rosary and St. Catherine of Sienna Elementary Schools. She went on to graduate from St. Mark’s High School in 2007. Later, she also attended Wilmington University for 2 years. Anna was a Nationally Certified Pharmacy Technician and she worked in that field in various capacities over the last 10 years. She enjoyed music and technology. She liked to spend time at the shore with her family, eating at the Lobster House and playing Skee Ball and Mini Golf. She was also an avid Philadelphia Flyers Fan and loved attending games with her Dad. Her cat, Elliott, was a great companion for her. She loved him very much. She is survived by her parents, Joseph and Jane Curran; brother, Joseph and his fiancée, Christina Rodriguez; many aunts, uncles, cousins, and friends all of whom will sadly miss her. Her funeral mass will be held on Thursday, October 4th at 11am at Holy Rosary Church 3200 Philadelphia Pike, Claymont, DE. Friends and family are invited to call from 10-11am in church. Burial will follow in Lawn Croft Cemetery. Donations in her name can be made to a charity of your choice. Amen. I pray that she is happy wherever she may be. It really upset me that I had just found out about her passing just recently. Before I found out this awful news I had heard she moved to Albuquerque, New Mexico. When we were together we would Facetime her friend that lived out there. I could only guess she was uer reason to move out there. I had known Anna since highschool. My most fond memory of her while in primary school was this time that I got bored of my long hair, so I decide to use my clippers and shave it all off. After i had did that, i thought to myself. “Let’s take this one step further!” I grabbed my razor and proceeded Bic my head. I showed up at school the next day as proud as could be. I got lots of looks and just as many laughs. I was prepared for this. Anna had come up to me later in the school day to be the 40th person to say something to me about my “chrome-dome”. We had an assembly in the gym that day and it was there she had first witness my head. She had told me, with a smile on her face, “your head looks like an egg”. We shared a good laugh over her observation. Anyway I will never forget you Anna. My family and I would like to send our condolences to your family for your dearest loss. May your family find comfort and hope in God’s promise for a better future. Where there will be no more sickness, sorrow, pain or death. These promises are found in God’s the Bible. Scriptures such as Revelation 21:3,4 and John 5:28,29. May reading these scriptures soothe your aching hearts during this most difficult time. Please be assured that your family will be in our thoughts and prayers. Jane, Joe and Joseph Jr. I am so sorry for your loss. Prayers. I will continue to cheer you on, Anna. I believe your spirit now has the peace that eluded you in this life. We are so, so sorry to hear about the passing of Anna. Words can’t express how sad and heartbroken we are to hear of her passing. She was a well mannered sweet and exception woman. She will be sorely missed by all that knew her. Please let us know if there is anything we can do for the family. We are deeply saddened by your tragic loss and our thoughts and prayers go with you. Anna will always be remembered. I am so very sorry to hear of your incomprehensible loss of Anna. I pray that your wonderful memories of her sustain you through this most difficult time.